There was a time when exercise was a chore and staying healthy began and ended at eating your greens. But fast forward to today and we're suddenly obsessed with quantifying our lives, discovering data we never knew before in a bid to eke out every morsel of fitness we can. A world where people have heart rate monitors that link to their phones and wristbands that track their steps. There are loads of smartphone compatible health and fitness accessories out there, but hit up our list of ten fitness gadgets (and accessories to power you through) and you'll be in prime position to get in the best shape of your life. Fitbit has made quite a name for itself with its range of fitness accessories as we've become obesessed with 'gamifying' our lives. The latest device from the company, the Fitbit Flex, is a fitness tracking wristband which keeps track of how many steps you take, how far you've travelled and how many calories you've burned. If you sleep with it on it can even track the amount and quality of your sleep and in the morning it can wake you up with vibrations, which is both a gentle way to rise and won't wake up your partner. It's water resistant so you can take it almost anywhere and it has a fairly minimalist design, lacking even a display. But if you want to see your stats you can just link it up to the Fitbit app for Android, iOS and Windows Phone, where you can then see all those stats along with your long term progress and it even has a section for logging your food. You can also sync your data with select third party apps such as Runtastic. If you'd rather have a display on your fitness tracker you could always opt for the Fitbit One instead, which has similar features and a little screen. 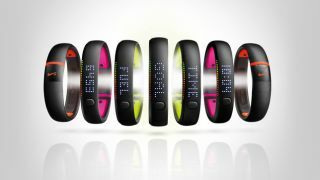 Nike has also embraced fitness bands and the Nike+ Fuelband SE is the product of its labour. However where Nike's offering differs from competitors is in its use of 'NikeFuel', which is what it gives you in exchange for carrying out activities. You can set a target daily 'NikeFuel' amount and then the Fuelband will use 20 coloured LED's to show you how close you are to reaching it, with them turning from red to green as you approach your goal. The new SE version even allows you to track different activities more accurately through 'Sessions'. It uses an accelerometer to judge how active you've been and as well as NikeFuel it can also show you how many steps you've taken or how many calories you've burned. It looks surprisingly stylish and can even display the time, so you can ditch your watch. It's also water resistant and has a five day battery life. You can get even more functionality by Bluetooth pairing it with the iOS app, after which you can sync it to the app and then see a breakdown of your activity over the last week, month or year. It can also further incentivise you by showing unlocked achievements and you can change your daily fitness goal straight from the app. The Zephyr HxM Bluetooth Heart Rate Monitor is a bit of a mouthful to say, but its features are fairly straightforward. You can wear it on your chest with the included strap, use Bluetooth to link it up to your iPhone, Android or Windows Phone 8 device and then get running.